A full wall of shelving or display space. Let's face it. Kids have alot of stuff. I love the idea of dedicating a whole wall to display and storage AND taking it all they way up to the ceiling. Color. Another great example of keeping it simple. White walls with warm woods always work. This blank canvas provides the perfect backdrop to all the "stuff". Long work table. I love long work surfaces. 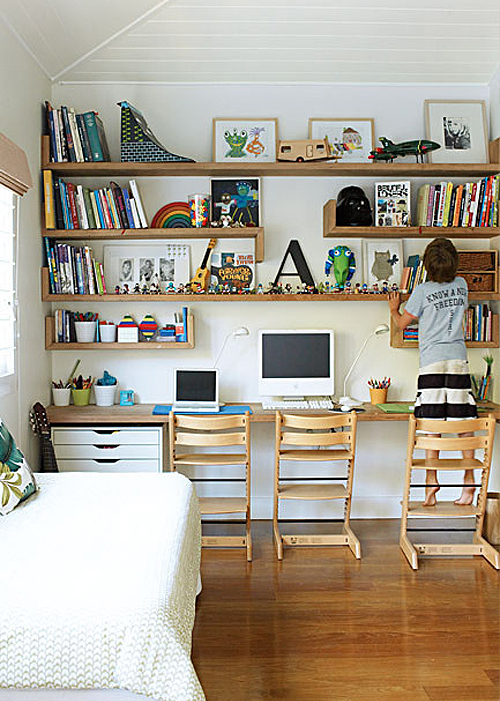 This workspace here maximizes the wall space and works so well for the 3 kiddos in this family. Corralling. What makes this space work is that like items are grouped together and small items are corralled in pots or boxes. Anything to lessen visual clutter. Mix it up. Styling a bookshelf is both an art and a science. Styling shelves in a child's space is no different. Often, what looks effortless, takes quite a bit of effort. (It does for me anyways) :) One tip shown here is mixing in objects with your books. For example, the Darth Vadar mask next to the Star Wars books. I also am finally ok with designating some things in a childs space as "look, don't touch". I think there is value in including pieces that truly are just for inspiration, special objects that spark the imagination. Here's another photo from this house tour. How cool is that? 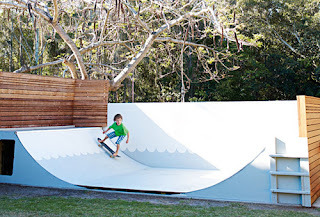 Clearly, any family who has one of these in their backyards, has some style and imagination! To see more photos of this family home in Australia, click on over here to the style files.